Hell used to be "other people" - now it's comic books made into movies. This could be fun though!! 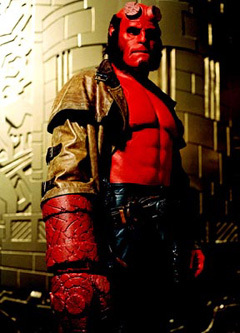 "Honestly dear - this makeup is hell to get into everyday"
He is Me: Just who is Hellboy, anyway? Good vs. Evil: Perlman talks about the plot of the film. Stunts An early look at some fight scenes. "I'm Learning Where It Comes From"